Lasto month in London, the Beer Mile World Classic took place, an International event completely dedicated to the mile with beer. For who do not know (yet) what it is that, the Beer Mile is a run consisting of 4 races track, spaced out with four cans of beer. It seems easy, but it is not at all. As great fans, after having known with passion about the new record set in London, we wanted to collect a page with the best alcoholic middle distance runners in the world. 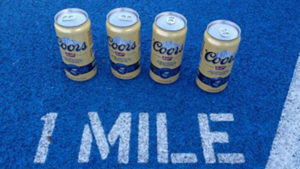 1– The first place goes, without any doubt, to the Canadian Corey Bellemore, the new record holder who lowered the beer mile world record to 4’34″35. Here it is the video of his performance that took place at the Allianz Park in London. 2 – Lewis Kent was the previous beer mile world record holder with 4’47″17. His performance was set at the Beer Mile World Championships in Texas in 2015. Unfortunately, his record did not last for a year “because of” Bellemore. In the video below, the undertaking that made Kent’s dreams come true. 3 – Third place of all time ranking goes to the British Dale Clutterback. During the same event of Bellemore, he tried to be on Bellemore’s tail but the Canadian athlete had the edge over. Besides 13 seconds of difference, 4’47″39 is the third best performance ever. 4– Brandon Shirck started competing in the Beer Mile only this year but he put the record straight presenting himself to the world with a 4’47″7. Here below the video is. 5 – Corey Gallagher is one of the major representatives of the sport. Graduated as first champion in 2014, in 2015 he established the world record with 4’54″38 but he did not manage to repeat himself surrendering the World Title to Lewis Kent. Among the 16 races, his best performance dated back to that event with a 4’48″62. In the video below the World Record. Bonus – Even though he is not anymore on the top of the all time rankings, a special mention goes to Nick Symmonds. Six times USA champion in 800m, Olympic finalist in London 2012, World second-in-command champion in Moscow 2013, Symmonds did not want to elude the charm of this sport running the World Championships in 2014 as well. Here below the video of his best performance is, 5’19″0 run in 2012 coming back from Olympic Games.